On this episode of Smart Kitchen and Bar, our resident master mixologist, Oscar Castaneda, shares with us ways to use infused spirits, like St. George Spirits’ Green Chile Vodka, in order to have a cost effective bar program. The key here will be to create cocktails that are approachable for your customers. 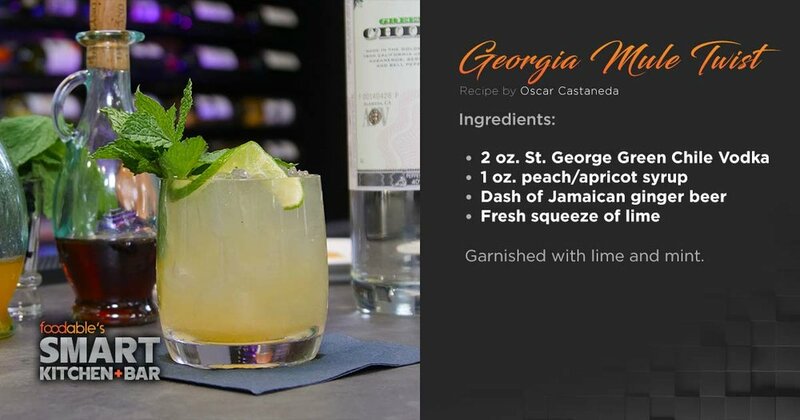 The intention for this upcoming drink, named Georgia Mule Twist, was to use a familiar drink like the Moscow Mule and use ingredients (like the peach and apricot syrup) that would play along with the hot and sweet pepper infused vodka to make an approachable yet unique drink. It’s served on a tumbler or copper mule glass and garnished with lime and mint. He proceeds to mix all his fresh squeezed juices to create a balanced sour base for the Georgie Kick cocktail, then he adds a maple reduction and egg white and gives it a heavy shake. What really makes this cocktail stand out is the cilantro meringue that was browned with a cook torch. Check out the Smart Kitchen and Bar episode to learn tips about how to make these drinks scalable for your beverage program! Watch More Kitchen And Bar Episodes! On this episode of Smart Kitchen and Bar, our resident master mixologist, Oscar Castaneda, shares with us how to take a different approach with a popular spirit like rum, featuring Mount Gay® Rum. The Black Barrel rum used in this episode features complex aroma notes of spice, toasted wood, and fruit. It has a bold spice taste balanced with oaky vanilla and sweet caramel. “Rum is something that might be a little bit too sweet and what I usually suggest as an operator and as a mixologist is: Don’t fight it, try to work with it!” says Castaneda. Old Fashioned cocktails are traditionally made by muddling sugar with bitters, adding whiskey and garnished with a citrus rind. Using that process as inspiration, Castaneda figures out how to incorporate rum into the classic cocktail for his first drink. Named Twist On An Old Fashioned, this drink will help you wow those guests who are looking to be adventurous. This cocktail will surprise anyone who tastes it, as it branches out of its classic presentation to become its own creation. Served as an Old Fashioned in a short, round, tumbler-like glass with a cinnamon, brown sugar, and nutmeg rim. It is topped with whipped cream (made out of almond milk, line, lemon and cilantro) and garnished with an orange peel, cinnamon stick, and topped with a black cherry. This next drink was inspired by the classic drinks that you would normally think of when someone says rum. Our master mixologist wanted to make a drink that was a little lighter and refreshing, but still maintained the tropical vibe that characterizes rum drinks. “We are going to use the same ingredients but in different layers to create almost like a new age of a Piña Colada,” says Castaneda. Garnish drink with two lime slices and orange zest. Check out the Smart Kitchen and Bar episode to learn tips about how to present these drinks in your beverage program! On this episode of Smart Kitchen and Bar, our resident master mixologist, Oscar Castaneda, shares with us interesting ways of using and presenting cocktails with spirits like brandy and gin, featuring St. George Spirits. These types of cocktails are on trend when it comes to the two popular sides of the drink spectrum focusing on one end the health-conscious consumer and on the other end the over-indulgent. “Brandy is usually something people think about as an after dinner drink or like a sipper. We want to show that there’s a way to make other things with it…” says Castaneda. The intention for this upcoming drink, named The Américan, is to make a dessert in drink form. Castaneda makes the argument for having a cocktail in your menu that will help guests end their restaurant or bar experience on a high note. Served as a martini with a graham cracker crust rim and garnished with a shaved pear and a cinnamon stick. This next drink was inspired by the “Zen movement” as Castaneda calls it The Yogi. Our master mixologist got his inspiration from the botanical and aromatic features from the terroir gin. “They want to transport you with their product to what inspires their process to begin with; therefore, what a better way to connect the dots than by mixing nature and our inner yogi,” says Castaneda. All ingredients except soda short shaken, then poured into a glass with soda water. Garnish glass with a basil leaf, blueberries, and lavender bitters. 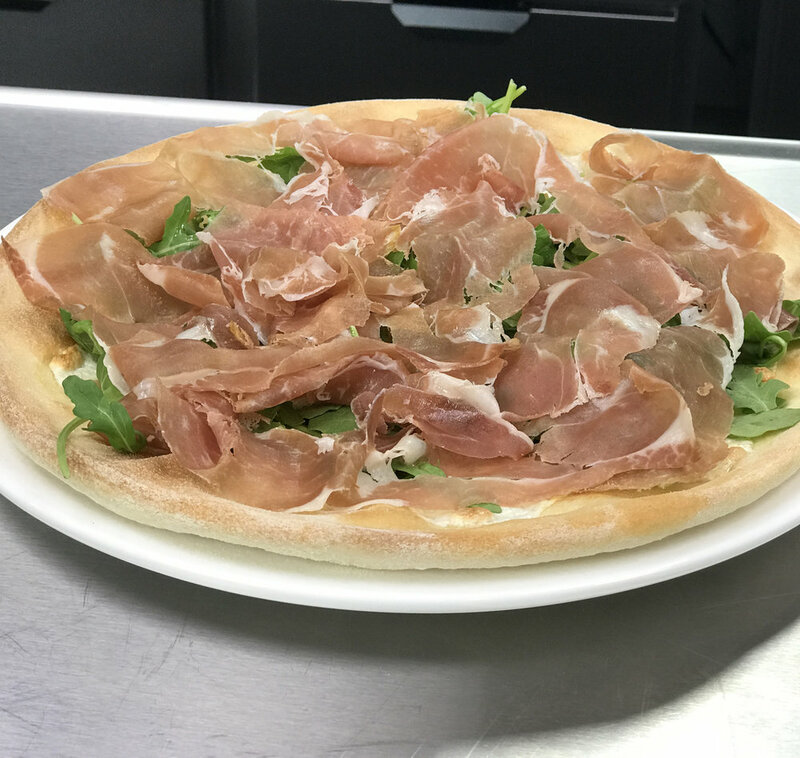 On this episode of Foodable’s Smart Kitchen and Bar, Executive Chef and pizza-making professional of Sette Osteria, Nicholas Flores, shares his experience of opening up a new location in Wynwood and schools us on the must-dos of pizza with our host, Paul Barron. Chef Nicholas learned from the best in Italian cuisine. Starting as a dishwasher at the tender age of 15, he honed his craft, moved up in the industry, and mastered the art of pizza. When the opportunity presented itself to open up another location in Miami, Fla., Chef Flores was open and excited to take on the challenge. The vibe of Sette Osteria and the neighborhood of Wynwood correlate perfectly. Sette Osteria has a very modern look with loads of green plants scattered throughout the location. Similarly, Wynwood is a bright, contemporary neighborhood surrounded by the green palm trees of Miami. Osteria couldn’t have been placed in a better spot. Chef Flores’ has many secrets to creating the perfect pizza. The technique has to have the same consistency to achieve the best results whether it be the ingredients, the dough, the method of cooking, etc. Chef Flores shared a few with us. 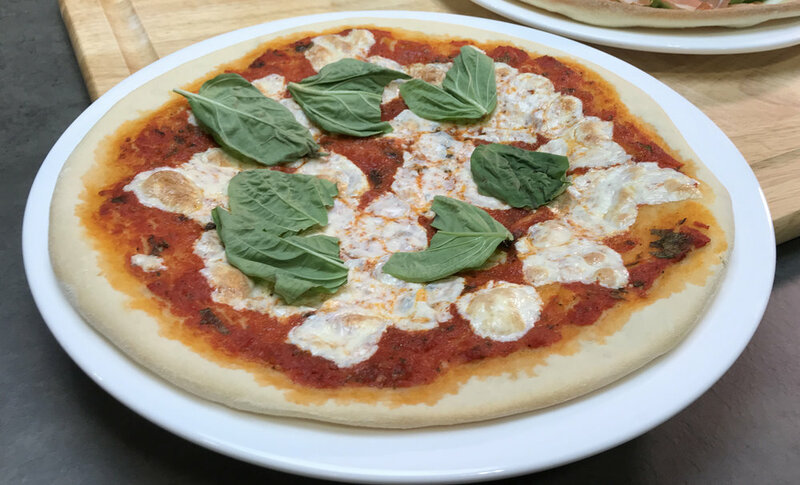 “The key to making the best Margherita Classica pizza is the mozzarella always has to be wet, the tomato sauce should be very light, and there should be plenty of cheese on top,” says chef Flores. Another fundamental to pizza is the dough. You can see the level of experience chef Flores has as you watch him pump out another pizza crust quickly and as perfectly as the last. He believes the pizza should be no bigger than 8-10 slices. If it’s too big, you lose quality in the crust. “I always make my pizza about a medium crust. If it’s too big, the pizza doesn’t have any body,” says Chef Flores. To learn more about how to make pizza, watch the video above of Smart Kitchen and Bar! Stretch the dough into the shape of a pizza. Drop diced mozzarella to cover dough leaving some gaps in between each piece of cheese. Leave about an inch without cheese to make a nice crust. Pop into oven for about 7 minutes (500-degree commercial gas oven) or until bottom of crust is no longer soft and has little dark spots underneath. Slice prosciutto into quarter-inch pieces. Pull out oven and put a handful of arugula over the melted cheese. Drizzle lemon oil dressing over arugula. Gently lay 4-6 slices of prosciutto over the bed of arugula. Ladle tomato sauce onto dough and make circular motions to push the sauce toward the crust. Leave about an inch without sauce to make a nice crust. Drop diced mozzarella over tomato sauce. Pop into oven for about 7 minutes (500-degree commercial gas oven) or until bottom of crust is no longer soft and has little dark spots underneath. Cheese should bubble when the pizza is ready to be pulled out of the oven. Top with whole or sliced/torn basil.